Although there are many different thicknesses and densities, a memory foam mattress topper is designed to sit on top of an existing mattress to make it more comfortable. The major difference in a memory foam topper and a memory foam mattress is that a memory foam mattress is meant to sit upon a hard surface. The memory foam itself is laminated to one or more pieces of foam to create the feel that you want whereas a topper is made of pure memory foam and will feel differently with the feel of each mattress you set it on. When you buy a whole memory foam sleep system, you get memory foam pillows, a memory foam mattress and a foundation (like a boxed spring, but without any springs). Buying a topper placing it onto a sagging, old, worn-out mattress defeats the whole concept. If your mattress is worn out or if you sit the memory foam mattress topper onto a boxed spring, the topper is going to sink in everywhere the mattress or boxed spring sinks in, defeating the way it's designed to work. For many people, any relief at all is better than nothing so if you realize that a memory foam topper isn't meant to be a replacement for a memory foam sleep system, then let's go ahead with our focus on toppers and what benefits you can expect from them. Memory foam mattress toppers, also called bed toppers, are made in varying thicknesses and densities. 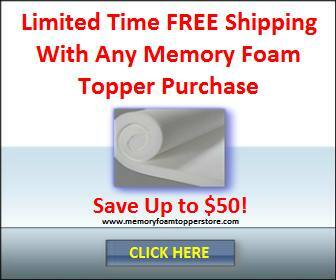 The most common memory foam toppers are 2" or so in thickness. There are a couple of really cheap ones that measure 1" to 1 1/2" thick. The best ones are 2" to 4" thick and of a denser material than the cheap ones. If you have a choice, try to buy the 4.0 lb. to 4.5 lb. density toppers because they have the best support and will last many years. The low density toppers of 2.5 lb. to 3.5 lb. will only continue to recover from your weight for about 10 to 12 months. After that, they will start to flatten out and show body impressions. Remember never to place a mattress pad on top of your mattress topper because memory foam works off of your body temperature, and anything you place between your body and the temperature-sensitive foam will greatly diminish the way your topper feels. If you want to protect your investment in your new memory foam mattress or topper, you should use only a mattress protector that has been developed specifically for use with memory foam so it won't affect the temperature-sensitive material beneath it. Remember, any memory foam mattress topper you purchase will be better than no topper. In some cases, you can spend less and get a great mattress topper that you'll be happy with for years to come. The main thing again is to look for the density of the foam and the thickness of the topper that you'll be sleeping on for the future.